Celebs have access to all the best when it comes to keep themselves looking young and healthy. But sometimes Mother Nature has other plans. In some cases, it is the celebs themselves who ruin their appearance with substance abuse or with other plastic surgery. In others, it is just a matter of getting old and not succumbing to the pressures of society. 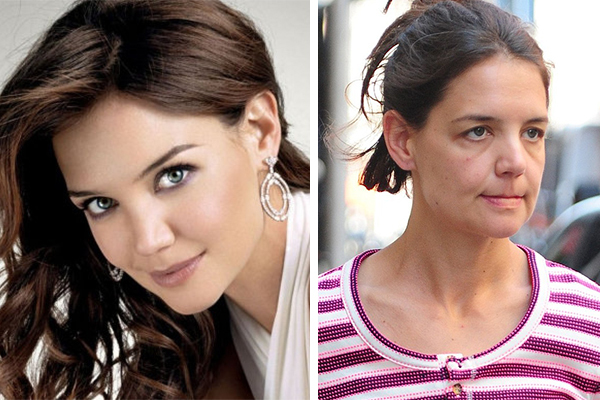 Katie Holmes was the girl next door in Dawson’s Creek and was definitely a cutie that had many men falling for her. However, the years and a life with the crazy scientologist Tom Cruise have given her a much older appearance than she deserves. One can’t blame her. It must be hard keeping herself and her daughter safe from Tom Cruise and his army of Scientologists.